Photo by Neil Grabowsky / Montclair Film, taken December 2017. Retrieved from Wikipedia. Stephen Colbert has 1 media appearance. To enter the signing line you must have a ticket. A signing line ticket is free with the purchase of America Again from Politics & Prose. One signing line ticket per adult. Colbert will not pose for photographs. Colbert will not personalize books—he will only sign his name. Stephen Colbert is currently considered a "single author." If one or more works are by a distinct, homonymous authors, go ahead and split the author. 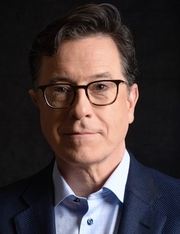 Stephen Colbert is composed of 5 names. You can examine and separate out names.